At times Francien and I felt out of place. Ever since we left Holland many moons ago, each year we visit to see our close family and attend special family events. Celebrating the 85th birthday of Francien’s mam was such a special occasion. 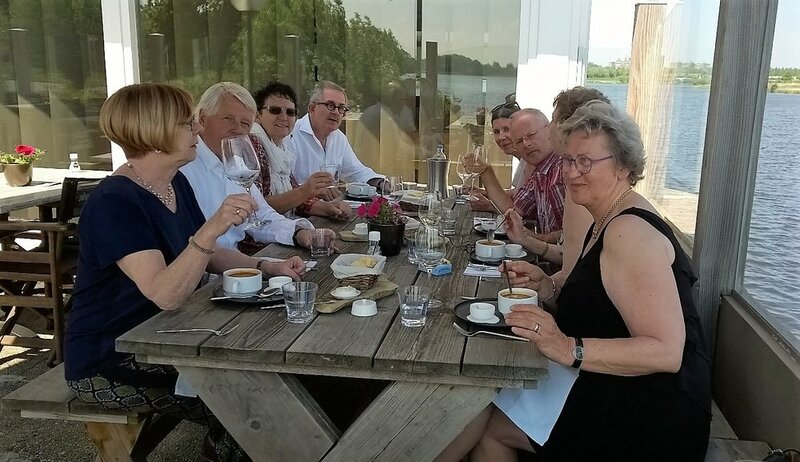 On our recent trip we travelled through the country to meet up with childhood friends, friends we met across the world and more (extended-) family. Let me tell you, this confronted us with our own youth and the path we had taken since! 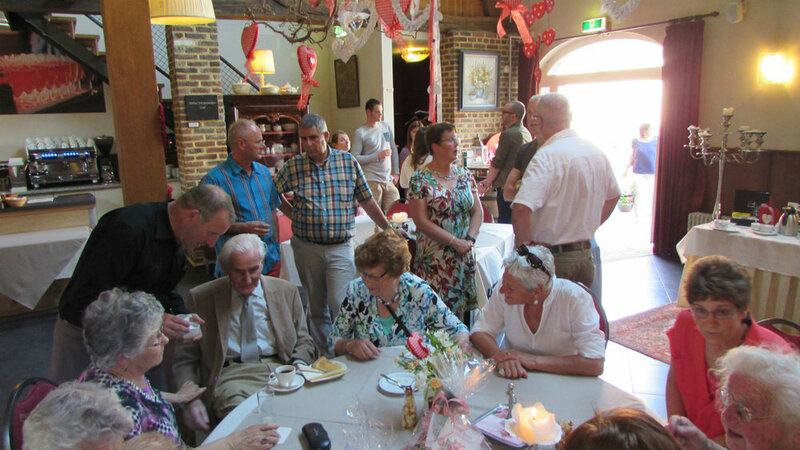 The cosy atmosphere inside the converted 700 year old farmhouse Biesenhof in the South of Holland set the stage for a joyful afternoon with aunts, uncles and cousins, celebrating oma’s 85th birthday. Good to see them and hear the stories about how life was treating them. Many were anxious about getting older, few had exciting plans to look forward to. Amazing to see four generations of our family in one room. The elderly seemed to know each other like they had coffee the day before, but I struggled to recognize some. All the octogenarians were positive minded and smiling! Unfortunately, fewer people since we met like this five years ago. … Oh, those good old times………. The next evening Francien, Winnie,Brad and I sat in the local snackbar eating chips. I enjoyed watching the uniformed members of the (historic re-enacted) city guards (schutterij) having a jolly good time. ‘How do you feel being back in your childhood town after so many years?’ Winnie unexpectedly asked me. Not surprisingly a lot reminded me of my own youth: the verdant hills with medieval castles, abbeys, churches and square courtyard farms. The sounds of cooing pigeons, twittering finches and the low-pitched warble of the blackbirds. The sharp smell of blossoms giving me hay fever today as much as it did all those many springs in my youth. The greasy snacks in snack bars, the vlaai (a local fruit-filled pastry pie) served with too many coffees we drank. In particular I liked the familiar and soothing sounds of the peoples dragging dialect. It was all so gezellig! But the new urban buildings and new roads with many roundabouts made me lose my way. When waiting in front of the Heerlen railway station one day, the security guard explained how it looked when I was still ten years old. ‘Remember the cobblestone road underneath the tunnel where the LTM buses used to drive?’ he enthusiastically recalled his own memories. It was like looking into a historic mirror. But now everything looked smaller as how I remembered; the farmhouse Francien grew up in Ten Esschen, the hills I used to struggle biking up against, the winding rural roads and the buildings in the city. One evening in Heerlen we had dinner in the Greek El Greco restaurant with seven of our childhood friends and partners. 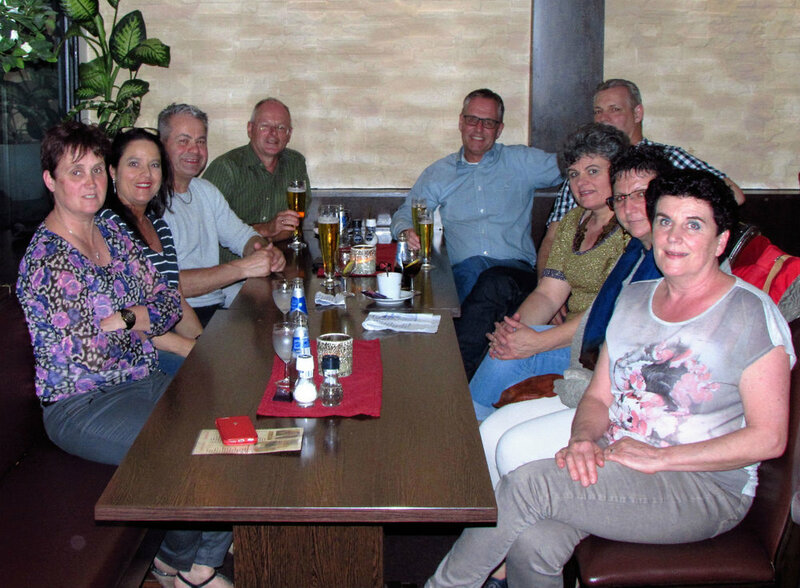 40 years ago this gang met and dated each other in the bar-disco 'Ouwe Stomp'just around the corner from here! We drank ample local Brand beer and talked lively about what we had been doing all those years; about our grown-up kids, some grandchildren, the desire to enjoy (future) retirement, family who had passed away. They had made a living as train-driver, business owner, administrator, civil servant. We all looked older (sorry about that…! ), but underneath still the same. Most of our lives were pretty much defined. Great to hear old stories (some we almost forgot) and all this with lots of Limburgse humor. It gave us all a glimpse of what we used to be. A fantastic evening. On a sunny spring day I took a bicycle and explored my childhood neighbourhoods: my parents apartment, the ‘Lange Jan’ monument, reminding me back in 1976, when I watched with my dad this 135 meters tall chimney of the Orange Nassau coal mine blow-up (I could not even imagine back then what I would do the next 40 years), the Catholic Tarcicius school I spent my first six school years, the abundant sandstone buildings of my former technical college. I cycled through the place I spent my youth trying to answer Winnie’s question, not knowing what I was looking for, certainly not finding that. 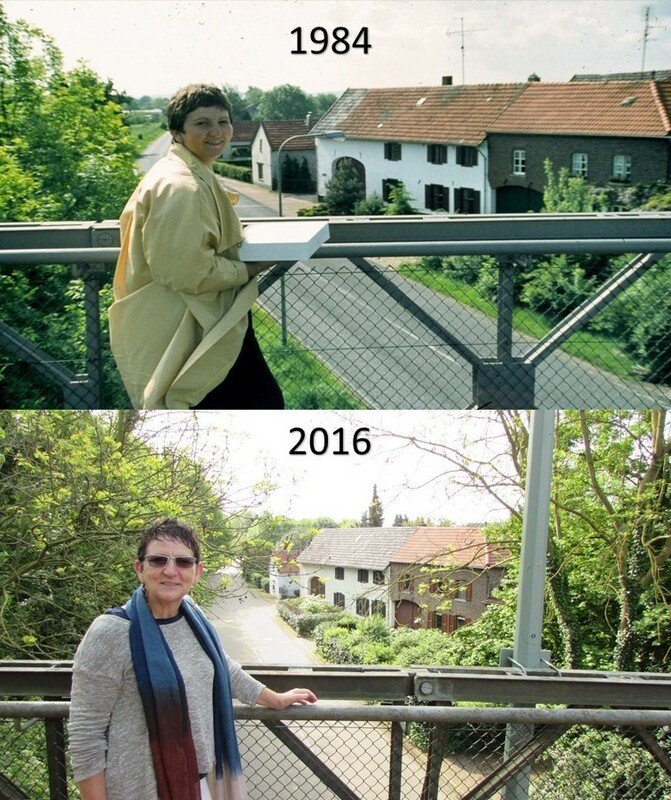 I also wondered: How much did my childhood in Holland contribute to what made me as the person today? I do not remember much details about that time. It had been a happy, but isolated and narrow-minded upbringing, which could not have prepared me for the big world out there! We continued our trip through Holland and got together with other friends we met in the USA, Kuwait, Saudi Arabia and Germany (some retired, some still working). Although we had ke pt in contact using the social media, nothing beats visiting each other! Meeting them was like coming home again. Some friendships seemed to have faded away after all those years, but there was so much to talk about, so much to laugh about, so much mutual understanding. Many of our children are now living across the world, but stay in touch with each other; our recent foreign travels; hobbies and activities at home to stay engaged; international events/politics; … ‘How is life in Kuala Lumpur?’ was the sincere question ask so many times by our curious friends. Friendships made in faraway places under at times difficult circumstances have deep roots! Francien and my view of the world has broadened dramatically due to all our travels. At times it was difficult (if not impossible) to share our stories with those friends and family who never had left Holland. ‘Some seem to know it all, others have pertinent opinions, some are envious, few are interested.’ a friend agreed with us. That made us feel out of place. As always it was nice to be here and see the people we know, but we felt very little in common with the place. Running in the crispy early morning on the Westerschelde dike, the rustling sound of seawater reminded me of ‘Fernweh’ when I was a teenager. Francien and I did heeded that call and now we felt like tourists in our country of birth. Home is no more home. Home is lovely Malaysia.